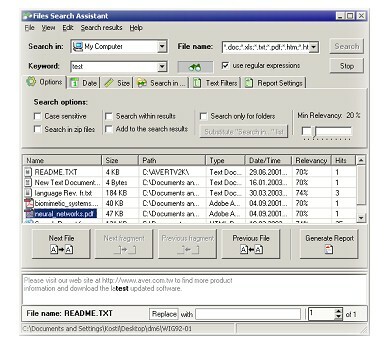 With Files Search Assistant you can search text in different file formats, for example in Adobe Acrobat (PDF) documents, MS Office files (xls, doc). Preview pane and other options make your search efficient and rapid. - Preview Pane – was design to save user form routine job. - There are some features, which make Files Search Assistant especially useful for anyone who works with different documents (different formats and different context). Instant ThumbView is a tiny image viewer that displays image thumbnails in a tooltip window when mouse pointer is hovered over an image file in Windows Explorer. It supports a lot of popular image file formats, including BMP, GIF, JPEG, PNG, EMF and is very handy for quick image viewing. To invoke it open any folder with image files in Windows Explorer, and then hover an image file with your mouse pointer. Marketeers and ECRM experts agree that personalized messages get better response rates than "mass-produced" messages. EasyMail Pro makes this easy, creating unique message content and subject lines via its powerful mail-merge function. HTML and Multi part (MIME) message capability support lets you include formatted text, HTML, attached files and embedded objects to your mails which are viewable regardless of the type of mail client used.